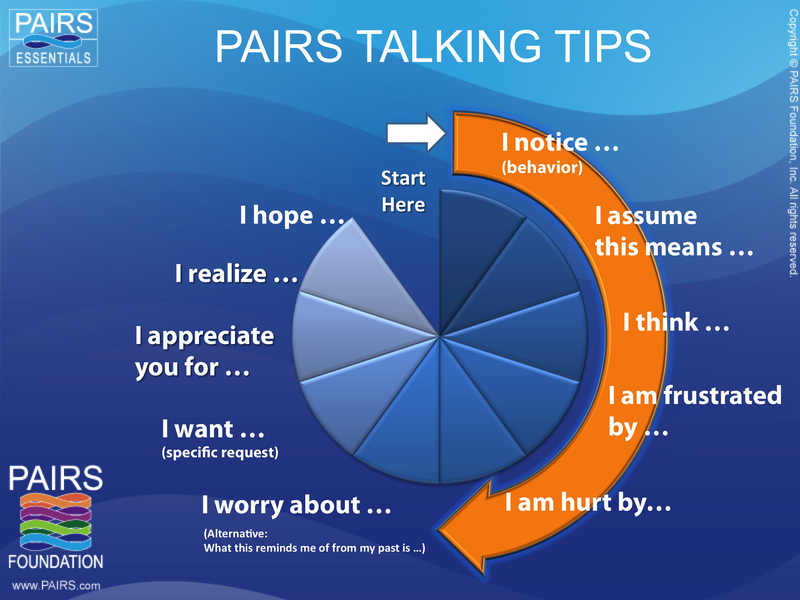 Before you try Talking Tips with a partner, check out these two videos on PAIRS YouTube Channel. Good talking is DIRECT. To send a message that other people can be sure to “catch,” you need to say what you mean. Don’t “talk around” the subject. Don’t just drop hints, or make other people guess. Get to the point! Good talking is CLEAR. Make certain that people can understand what you’re saying, and don’t just have a “snowy picture” of it. You need to describe things well. You need to make sure that you aren’t confusing your listener! Good talking is SPECIFIC. Sending a message effectively means giving your listener all the necessary information. Don’t be vague or general when you talk. Include details that can help the other person know exactly what you’re talking about. Good talking is HONEST. For your message to do the most good, it needs to be honest. Don’t say something you really don’t think or feel, or that doesn’t match the facts. Good talking is TACTFUL. Being tactful means being kind. You have to think about others feelings before you speak. You do want to be direct, clear, specific, and honest with them. But you don’t want to say things accidentally or on purpose that will hurt them unnecessarily. Words can hurt. Good listening is ACTIVE. Good listening is more than just waiting until you can talk, or until the other person stops talking or truly says something that interests you. Good listening is doing your best to hear, understand, and help the person who is talking to fully express what they want you to know. Good listening is ATTENTIVE. To listen well, you need to concentrate on what the other person is saying. Make sure you get the full message that they are sending. Don’t try to guess what they mean. Don’t try to do something else at the same time–like planning what you want to say next–you will probably miss something important! Good listening is OPEN. Good listening means giving the other person the freedom to speak, and giving you the freedom to learn something. To do this, you need an open mind … one that doesn’t refuse to hear certain things. After the speaker finishes, you can decide whether you agree or you don’t agree with what was said. But while the speaker is talking, you need to agree to fully listen. Good listening is RESPECTFUL. Good listeners never interrupt a speaker in the middle of a sentence. They only start speaking after the other person finishes a sentence and pauses. This way, they make certain that they hear everything the other person wants to say, and that they don’t make the other person feel worthless or angry. Good listening is CAREFUL. To be a good listener, you need to ask the speaker right away about anything that you didn’t hear well, that isn’t clear, or that you didn’t quite understand.